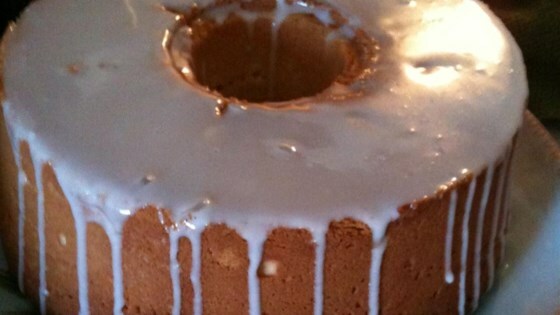 "Butter and cream cheese provide the rich taste in this deliciously dense pound cake. I always top mine with a fresh lemon glaze made of fresh lemon juice and confectioner's sugar." Preheat oven to 325 degrees F (160 degrees C). Grease and flour a 10-inch tube pan. Beat butter and cream cheese together with an electric mixer in a large bowl until smooth. Beat sugar into butter mixture until light and fluffy. The mixture should be noticeably lighter in color. Add the eggs two at a time, allowing each pair of eggs to blend into the butter mixture before adding the next. Beat in vanilla and almond extracts with the last eggs. Pour the flour and nutmeg into the bowl and beat until just incorporated. Pour the batter into the prepared tube pan. Bake in the preheated oven until a toothpick inserted into the center comes out clean, about 80 minutes. Check for doneness after 1 hour. Cool in the pan for 10 minutes before removing to cool completely on a wire rack. I altered this recipe to make it my own and it turned out good. absolutely delicious...i followed the recipe but added a hint of lemon flavoring..its great and eay to make! !